Though I’m a little (okay, way) past the age where birthdays are something I look forward to, this year’s was probably one of the more memorable ones. The invite had come a few days prior complete with a classy bright yellow umbrella, complements of a rather classy establishment – the Cactus Club Cafe. It was set to open its second GTA local, about ten minutes from where I live. And my birthday was going to be spent eating, drinking, and celebrating the launch of Cactus Club Cafe Sherway. Truth be told, this was the second Cactus Club Cafe opening I had the pleasure of attending. The first Toronto locale touched down a few years ago. Originally from Vancouver, the CCC has been conquering Canada west to east. From Vancouver to Calgary, and now – firmly – Toronto. 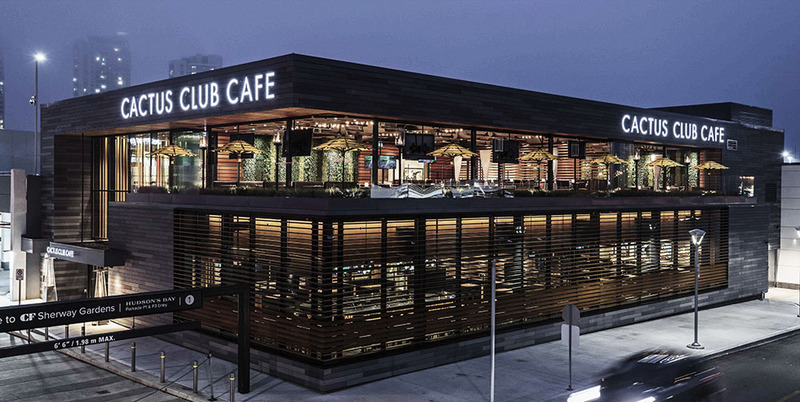 The new Sherway location is a “café” in name only – unless the cafés you frequent are two-story, 450-seat numbers that sport retractable roofs (in the case of CCC Sherway, one of the largest to be found in any North American restaurant), and original artwork from the likes of Andy Warhol, Jean-Michel Basquiat, Japanese contemporary artist Takashi Murakami and well-known LA street artist Mr. Brainwash, plus a breathtaking custom piece by Daniel Mazzone that adorns the wall of the two-story entranceway. You don’t come here for croissants and espresso (though i’m sure the kitchen could rustle this up if you insisted). No, CCC Sherway is a restaurant, and a really good one to boot. CCC’s Sherway kitchen is led by a team of world-class chefs including Iron Chef America champion Chef Rob Feenie, and Head of Culinary Development, Toronto, Chef Cory Vitiello. The menu features a mix of signature dishes, such as Chef Feenie’s Butternut Squash Ravioli with Prawns (totally awesome – I’ve had it twice) and Double-Braised Short Rib, as well as new highlights including Chef Vitiello’s Lobster and Prawn Tagliatelle Nero (also awesome). Of course, you can’t enjoy this stuff without some serious liquid. Thankfully, said liquids have been sourced by the CCC’s rock star (and far too humble) VP Service & Head Sommelier Sebastien Le Goff. It’s a fine line to walk – between not intimidating “emerging gourmands” (those transitioning from, say, The Keg) and not insulting, well, real gourmands (or “influencers” – don’t get me started). Le Goff’s wine list offers a clinic in “cover every base” sensibility. Want a straight up Italian Pinot Grigio? Done. It will be one of the best of a simple lot. However, if you care to take a walk on the wilder side, just say so. You just might be convinced to stick around till the roof comes off.